Mike Merenda and Ruthy Unger are Hudson Valley based songwriters who have made waves in the Americana world and beyond. 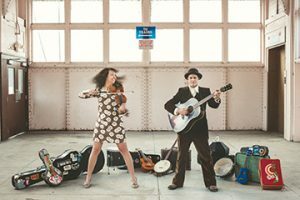 In 2018 they reformed their seminal stringband The Mammals and released the self-produced, Sunshiner, which Tape-Op magazine called “some of the best folk-rock music you will ever hear.” These two believe in the transformative power of a great live performance. Tickets are $20 at the door and $17 in advance at BrownPaperTickets.com. Find out more about the duo at MikeandRuthy.com.